Saturday, August 26, 2017 marks the beginning of the 60th year of the White Stag Youth Leadership Development program. In 1968, I attended the program as a nervous, skinny 13 year old. Four days before, I’d been placed in a crew of five other tall young men who I’d never met before. 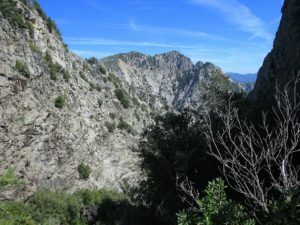 Now we had been given a hurdle to hike cross-country to the top of the rugged 4,852′ Ventana Doublecone peak. Deep in the brush of the Big Sur wilderness, we hiked all day. Navigating by map and compass, we followed Puerto Suello creek upstream, sure of our success. Our 16 year old Crew Advisor Larry Challis quietly asked more than once if we were sure we were headed in the right direction. We confidently pressed ahead, bushwhacking through the brush and trees. As the sun set and with our water almost gone, we finally figured out we were someplace near Comings Creek and miles from our destination. We bivouacked in a tiny clearing in the middle of the manzanita and ceanothus. Larry never let on he knew exactly where we were or that he had a gallon of water in his pack, facts I only learned 35 years later. Discouraged, we ate what we could and slept the night there. The next morning we tripped across an improved trail only 100 feet from where we’d slept. We ingloriously returned to base camp, chagrined and humbled, only to find none of the other five crews had made it to the Doublecone either. Larry sat our crew down and taught six 13 and 14 year old boys how to evaluate, and we dissected our decisions and figured out how we’d gone wrong. He helped us learn about sharing leadership and different styles of leadership. The next day our crew got a chance to apply what we’d learned during the week. We led the five other crews in a day-long pioneering project to build a 30′ foot bridge across the Little Sur River. We applied our communication skills, we used our resources as we’d been taught, we planned, consulted, and delegated. Right on the dot at 5:00, we completed our objective. During that week, we learned deep lessons about ourselves and leadership in a real way that no classroom, PowerPoint, or book could ever teach us. We gained confidence in ourselves. We learned about human relations, setting the example, controlling the group, representing the group, and managing learning in meaningful, realistic situations. Fifteen years after getting lost that day in the brush, I became the adult leader of that Phase 3 Troop Leadership Development program. A boy named Tom Weibert came to camp, and I served alongside his parents. In 1984 I was selected to serve as the Program Director for the entire organization. Since then, my sons have attended the program. That Patrol Counselor of mine, Larry Challis, is currently the Program Director. His sons are serving on youth staff. That boy Tom Weibert is now President of the non-profit White Stag Association that administers White Stag, and his children are on staff as well.